This is a book that any mother should read, even one that hasn’t previously been obsessed with taking pictures of her kids, because she will be when she finishes the book. I’ve tried reading photography books in the past and all I’ve ever ended up with was a big headache, not the incredible skills I had been trying to achieve. Lets face it, photography jargon feels like a completely foreign language and it can be horribly confusing. A friend of mine used to casually throw words about like aperture and iso as if I should understand her. Granted, I’d heard them before, but I had NO CLUE what they meant. 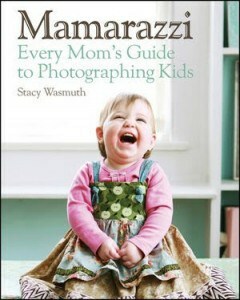 This book is written for the every day mom and budding photographer, so it’s been ‘dumbed down’ so to speak. I finished Chapter 6: Camera Crew which is all about the features and functions that camera’s possess and it was like a light had been turned on in my mind. It all suddenly made sense. This didn’t feel like I was reading a ‘how to’ book, it felt more like an art book that happened to be teaching me. There are display photos on every page to demonstrate the concepts that are being talked about. I found the comparison photos to be especially helpful in the chapter on editing photos. It helps to have that visual of why a picture looks better if it isn’t overexposed. I particularly loved all of the creative suggestions. It made me eager to pick up my camera and create these fabulous photos. At the moment I just have a simple digital camera, but I learned tips and tricks that will help me create breathtaking photos. And when I’m finally able to upgrade to that DSLR that I’m craving, I’ll know how to use it thanks to this incredible book.